The UPA government says it is confident of achieving a 9 per cent economic growth in the 11th Five-Year Plan and containing inflation in 2008-09. Speaking to media after presenting the Economic Survey 2007-08, finance minister P Chidambaram today said that the government will help ensure overall welfare of common man. Painting a gloomy picture on external trade front, the Economic Survey today advised the government to extend relief to Rupee-hit exporters warning that the global slowdown, particularly in the US, would impact India’s export growth in 2008-09. Banks in the region are flouting the directive issued by the Reserve Bank of India (RBI) by offering higher rates of interest on bulk deposits. Though the apex regulatory bank has asked the banks not to rely on bulk deposits, the latter seem to be competing with each other to attract the bulk deposits from various municipal corporations, state government departments, educational and health institutions and various boards and corporations. The rapid growth of economy in the past four years, which has been accompanied by a sharp increase in the volume of air traffic, both international and domestic, has not been very kind towards the domestic scheduled operators and major mergers and acquisitions (M&A) could be expected in the future. There was good news from Maruti Suzuki India Limited (MSIL) and Hyundai Motor India. While MSIL achieved another significant milestone with its cumulative exports crossing half a million mark i.e. five lakh units, Hyundai came out with a special scheme for women to mark the International Women’s Day and Women’s Week starting Saturday. One of the biggest challenges to sustaining and stepping up industrial growth lies in removing the infrastructural impediments in road-both rural and urban-rail, air and sea transport and power, according to the Economic Survey of 2007-08. The Economic Survey has reiterated that the government should raise output by privatising the oil fields and hence reduce dependence on imported crude oil. Expressing concern over loss of dynamism in agriculture and allied sectors in recent years, the Economic Survey has emphasised the need for second green revolution, particularly in areas that are rain-fed to improve income of people dependent on farm sector. Outlining far reaching policy reform options, the Economic Survey for 2007-08 called for phasing out control on sugar, fertiliser and drugs, allowing 100 per cent FDI in Greenfield private-rural agricultural banks, raising foreign equity share in insurance to 49 per cent and increasing the work week to 60 hours from the existing 48 hours in the Factories Act. World’s premier measurement company, Agilent Technologies will be setting up a state-of-the-art research and development centre at the IT park in Manesar near Gurgaon. The centre, to come up with an investment of $25 million, will become operational by the end 2009. “With a better targeting of government reserves and increase in quality, we can ensure the overall welfare of the common man in terms of both private consumption and supply of public goods,” the finance minister said. Given the solid foundation of domestic investment and savings, we are confident of meeting the 11th Plan target of nine per cent average growth, he said. Chidambaram said economy has moved to higher growth trajectory during the five years to 2007-08 in terms of GDP with an average growth rate of 8.7 per cent per annum, indicating stability and sustainability. 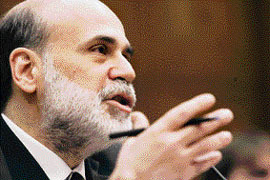 The finance minister said fundamentals were inspiring confidence and investment climate was full of optimism. At the same time, he said India needed to respond to the evolving situation in the global economy to ensure that growth story was not affected while emphasising on the need for capitalising on the opportunity arising from favour conditions. After remaining at below 4 per cent for six months, the inflation rate has touched 4.35 per cent for the week ended February 9. With hike in petrol and diesel prices recently, it is expected to go up further. "Keeping inflation under control in an uncertain global environment will be one of the major challenges in 2008-09," he said, adding slowdown and possible recession in the global economy posed risks to growth. He said the high GDP growth has benefited the common man as well, as reflected by a near doubling of annual growth rate of per capita consumption to 5.1 per cent in 2007-08 compared to 2.6 per cent for the previous 11 years. He also expressed concern over slow pace of growth in agricultural sector and bottlenecks in the infrastructure sector, and emphasised the need for mobilising public and private resources for inclusive growth. The outlook for exports in 2008-09 may not be as bright as in the past few years with lower projections in world GDP and world imports and exchange rate developments, according to the pre-budget Economic Survey tabled in Parliament by finance minister P Chidambaram today. 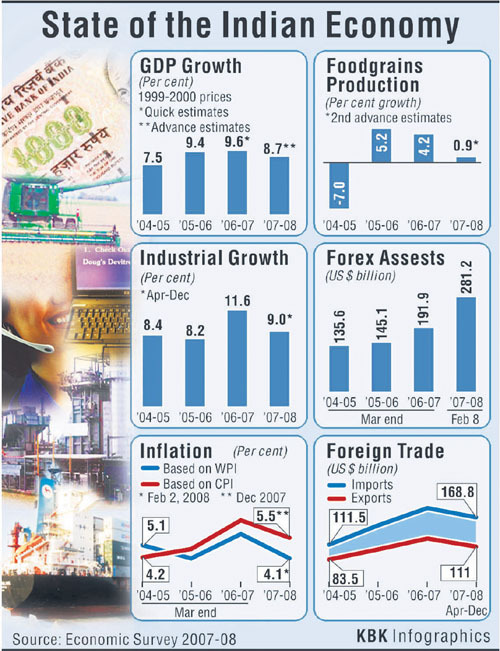 India’s exports stood at $111 billion in April-December 2007, registering a growth of 21.6 per cent. But it may fall short of the $160 billion export target set by the government for the 2007-08 fiscal. The rupee appreciated by 9.8 per cent against the dollar between April 3, 2007, and January 16, 2008. During the first nine months of 2007-08, only 69.4 per cent of the $160 billion-export target for the current fiscal has been achieved. The survey said the two developments that need to be monitored are the fall in export growth to the US in general and fall in textile exports in particular to the US and EU. Though exports to the US have already been slowing in 2006 and 2007, a further slowdown may be unavoidable, but may be relatively modest. The slower Indian economic growth in 2007-08, relative to 2005-06 and 2006-07, may also have a temporary dampening effect on capital inflows, it said. Underlining the need for some fundamental policy changes besides relief measures already given, the survey suggested measures for merchandise trade sector. The measures include continuation of reduction in customs duty resulting in low import duty, weeding out of unnecessary customs duty exemptions, abolishing export schemes that are redundant with fall in import duties and streamlining existing schemes. For services trade, the major areas where reforms can help sustain export growth are domestic regulations and reforms and market access for services, the survey said. It further said even as the external environment remained conducive to the nation’s growth, problems of managing a more open capital account came to the fore in terms of the economy approaching the limits of its absorptive capacity. “While the situation of excess inflows is likely to remain, the pressure on reserve accumulation and exchange rate appreciation is likely to ease,” it said. It is learnt that the banks are offering 9.10-10 per cent higher value rate of interest (finer rate of interest) on bulk deposits for short-term deposits, though the card rate for these deposits is between 8-8.25 per cent. In fact, a number of banks have set up teams to chalk out the deposit mobilisation and are visiting the government offices and health and educational institutions and are offering them higher rates of interest. Most of the banks are facing a liquidity crunch because of the high lending costs. They are thus trying to cap maturing bulk deposits and reduce lending costs by offering higher interest rates. As a result, while some banks are offering 9.10 per cent rate of interest for a period of 46 days, 9.30 per cent interest is being offered for a deposit for 91 days. Sources in the banking sector informed The Tribune that this “deposit war” is a result of the banks’ trying to make up the year-end targets. On their part, the government departments, boards and corporations and private institutions are looking at making a quick buck through these ‘incentives’ offered. It is learnt that cash rich boards and corporations like the urban development authorities of Punjab and Haryana, housing boards, warehousing corporations, mandi boards, HAFED and Markfed are being approached by banks to avail this “annual incentive”. Interestingly, the Government of India, too, has asked all public sector undertakings to maintain a 60-40 ratio while going in for bulk deposits (60 per cent for card rate and 40 per cent on finer rate of interest). However, most of these PSUs are ignoring this directive. The RBI has now cautioned banks against relying on these bulk deposits as it could lead to a funding crisis, as in the case of the US. They have asked the banks to focus more on core deposits. Troubled at the growing trend, the RBI has stepped up vigilance on banks to ensure that a similar crisis situation may not arise in here. The figures brought out in the Economic Survey 2007-08 point out that although the Indian skies have seen major liberalisation but it has also brought in competition for all airline operators. “The profitability of the domestic airline industry is under tremendous pressure as almost all airline operators in the country are reported to be making losses,” says the survey. The government says that given the intense competition between the airlines and the declining margins, a process of consolidation is perhaps inevitable. However, the survey points out that more and more Indians have been taking to the air and even the international traffic has grown tremendously, forcing the government to take immediate measures for upgrading the infrastructure. According to the survey, the number of domestic and international air passengers, together, has almost doubled between 2004 and 2007 and cargo traffic has increased by more than 45 per cent. As per the provisional figures available, international and domestic passengers recorded growth of 15.6 per cent and 32.51 per cent, respectively, during 2007. Similarly the international and domestic cargo recorded growth of 13 per cent and 9.8 per cent, respectively. Seeing this growth chart, the ministry of civil aviation has also given an “in principle” approval for import of 496 aircraft and in the next five years, more than 250 aircraft are likely to be acquired by the scheduled operators. There was good news from Maruti Suzuki India Limited (MSIL) and Hyundai Motor India. While MSIL achieved another significant milestone with its cumulative exports crossing half a million mark i.e. five lakh units, Hyundai came out with a special scheme for women to mark the International Women’s Day and Women’s Week starting Saturday. While Maruti Suzuki cars ply in all five continents, Europe has been a popular destination accounting for 56 per cent of the company’s cumulative exports. Netherlands with 67,700 units followed by Italy (over 41,000) and the UK (over 34,000) have been the biggest European buyers. Amongst the non-European markets, Algeria is the biggest buyer with over 42,000 units, followed by Chile, Sri Lanka and Nepal. On the other hand, Hyundai announced the launching of a new scheme for its women customers to mark the International Women’s day and Women’s Week. The company officials said the flagship model of the company, Santro, would be made available to its customers with an automatic transmission at a more attractive price tag. The price has been reduced by approximately Rs 14,000 to increase its appeal. A 0.75 per cent discount on the interest rate is being given and the loan-processing fee has been reduced to 50 per cent. The survey also felt that sectorally differentiated initiatives might be required for skill upgradation, supply augmentation of inputs and promotion of research and development. The first eight months of the current fiscal, till November 2007, witnessed a moderate slowdown in the growth of the industrial sector. The slowdown has mainly been on account of the manufacturing sector. Asserting that the real challenge before the country lies in strengthening the foundations of sustained industrial growth, the Survey pointed out that growth in infrastructure not only alleviates the supply side constraints in industrial production, but also stimulates additional domestic demand required for industrial growth. Another issue in industrial growth is the swiftness and efficacy with which the skill deficit felt in many areas of manufacturing is bridged. This will facilitate research and development and technological innovations, which are urgently called for in important industries like chemicals, automotives and pharmaceuticals. The Economic Survey has also said there is an imperative need to facilitate the growth of labour intensive industries, especially by reviewing labour laws and labour market regualtions. This is particularly important in reversing the current “not-so-encouraging” manufacturing employment trends. Besides, the growth in many industries is constrained by the acute scarcity/depleting reserves of important raw materials like coal, iron ore, natural gas and forest reserves. India, which spent $48.389 billion to import its crude oil needs in 2006-07, has already spent $48.02 billion on crude imports in the first nine months of the current fiscal because of rise in international oil prices. The pre-budget survey that was tabled in Parliament, suggested selling old oil fields to private sector and for application of improved and enhanced oil recovery techniques. Besides stepping up domestic production, the remaining deficit would have to be bridged by entering into strategic geo-political alliances to access energy assets in the region, the Survey said, pointing to the need of making investments in energy chain in West Asia and Africa. Reducing incremental import dependence of the country’s energy requirement requires tapping of coal reserves, accelerating exploration of oil and gas, fully exploiting the nuclear and hydro potential for power generation and expediting programmes for energy generation through renewables, the survey stated. While production from old fields declined, the award of 162 new areas for exploration under New Exploration Licensing Policy (NELP) since 1999 have led to 46 oil and gas discoveries to add 600 million tons of oil equivalent hydrocarbon reserves. As on April 1, 2007, the investment made by Indian and foreign companies in NELP blocks was $ 3.887 billion, out of which only 30 per cent was by the national oil companies. The survey stated that increasing farm incomes was necessary for equitable growth, warning that any slowdown in this sector would hurt the economy by translating into a lower overall GDP growth. In view of uncertainties in global markets and hardening prices of food, fuels and edible oils, the government in its report card on farm sector said domestic price stability and food security critically depend on growth in the agriculture sector. Acceleration of growth of this sector will not only push the overall GDP growth upward, it would also make growth more inclusive and biased in favour of women, it said, adding that with area under cultivation remaining constant, improving productivity of crops was necessary to strengthen the sector. In all, the survey estimated the agriculture, forestry and fishing sector to grow at slower 2.6 per cent this fiscal as against the previous year’s growth of 3.8 per cent. It said besides weather-induced fluctuations, the output of the sector had been affected due to reduced capital investment and pleateauing of yield levels in major crops. The overall food grains production in 2007-08 is expected to fall short of target by 2.2 million tonnes, though it is expected to be 10.1 million tonnes higher compared to second estimates for 2006-07. The overall production of foodgrains was estimated at 217.3 million tonnes in 2006-07, an increase of 4.2 per cent over 2005-06. The production of non-food crops, particularly sugarcane, cotton and jute, exceeded both targets and levels achieved in the previous year. Production of sugarcane is estimated to exceed the target, though it will be lower than the previous year. A shortfall of 2.8 million tonnes (10%) is expected in the production of oilseeds compared to the target though it is still expected to be higher by 2.9 million tonnes compared to the final estimates of 2006-07. In listing a dozen policy reform options, the Economic Survey underlined the need for completing the process of selling 5-10 per cent equity in previously identified profit making non-navratnas, selling old oil fields to private sector for application of improved/ enhanced oil recovery techniques and introducing a separate section on bankruptcy in the Company Law or come forward with a new bankruptcy law which facilitates exit of old/failed management as expeditiously as possible. The public transport (bus) systems in metros and large cities must be run by organised private companies that can use modern logistics and back office systems for planning routes and timings, acquiring and analysing data on usage densities and running an integrated people movement system. A comprehensive system of road parking fees must be devised and introduced in metros and large congested cities. With regard to the freight corridor of the Railways, it suggests a public sector rail track company must own new tracks and signals besides allowing free entry of private and public-private partnership in rail freight companies. In the power sector, the State Electricity Regulatory Commissions should notify rational, credible, cross subsidy for open access so that it can become a reality. Foreign equity share in insurance be raised to 49 per cent. Allow 51 per cent foreign equity in a special category of insurance companies that provide all types of insurance to rural residents and for all agricultural-related activities, including agro-processing. The Coal Mines Nationalisation Act must allow regulated private entry into coal mining. In town to inaugurate the company’s facility at Chandigarh today, Venkatesh Valluri, president and country general manager of Agilent Technologies, informed TNS that this centre will focus primarily on research in the areas of life sciences and electronics measurement. The centre will be spread over an area of 10 acres and will be the largest backend captive centre for IT and business processes. This is the second R & D centre to be set up in India, after the Bangalore facility has been upgraded to a centre of excellence and made a global research laboratory for Agilent Technologies in January this year. He said that the company would be investing $35 million in their Indian operations this year.